On Saturday, they played a hockey game outdoors in California, and it says something about the evolution of the NHL that the whole thing didn’t seem all that remarkable. That’s not supposed to be the case with these outdoor games, and it certainly wasn’t the case last year when the league set up shop at Dodger Stadium. That game felt like something wholly unique, with beach volleyball and a marching band and a performance by Kiss, as hockey fans across the continent tuned in to find out whether the ice would melt. It didn’t. In the end, it all came together perfectly. This year’s game, played in front of just more than 70,000 fans at Levi’s Stadium, didn’t carry that same first-time curiosity factor, and that may help explain why there seemed to be so little buzz about it. Heading into Saturday, there was as much focus on the standings as on the setting. This was perhaps the league’s first outdoor game where the emphasis was firmly on the “game” part of the equation. In the last decade, the state of California has won three Stanley Cups, one Presidents’ Trophy, and two MVPs, all while serving up the best three-way rivalry in the sport. The state’s teams have been so good for so long that fans around the league now warily eye their favorite team’s schedule for the dreaded California Road Trip of Doom. So when it comes to California hockey, there’s an overwhelming temptation to ignore the past, because the present is just so much better. But you’d be missing out if you did, because the history of the NHL in California is rich and deep and completely ridiculous. And it was hard not to think about that on a Saturday night at a football stadium. That Gretzky guy turned out to be pretty important a few years later, when he was traded to the Kings in 1988. That move put the Kings on the map. They switched to modern-looking black and silver uniforms, and suddenly, almost overnight, the Los Angeles Kings were cool. But it was an L.A. cool, and in hockey, that’s not a compliment. After all, you still had the B-list celebrities and Barry Melrose’s mullet and that blue bandanna thing that Kelly Hrudey wore. For most of their first four decades, the Kings were one big punch line. Two Stanley Cups later, nobody’s laughing anymore. The San Jose Sharks entered the league in 1991 as a quasi expansion team, part of a complicated split from the Minnesota North Stars that nobody really seemed to fully understand. They played in something called the Cow Palace, took to the ice by skating through a giant shark’s head,2 and introduced the word “teal” to the hockey world’s vocabulary. They were also terrible. They finished dead last in each of their first two years, establishing a league record for most losses in a season in 1992-93. But they made the playoffs in 1994 and even won a round thanks to Chris Osgood’s brain cramp. That would start a run of 17 playoff appearances in 20 years. They’ve won six division titles and had seven 100-point seasons. They’ve also never lost a Stanley Cup final game, which sounds nice except that they’ve never won one either. That’s the reputation the Sharks have forged over two decades: Year after year, they’re good in the regular season and then find a way to fall apart in the playoffs. And that brings us back to the Los Angeles Kings. Until very recently, the Kings had spent the entire season desperately trying to look like a bad team and not fooling anyone. When the matchup between the Sharks and Kings was announced last summer, it was projected as a grudge match between two of the league’s elite teams. The Kings are the defending champions. The Sharks have been one of the league’s top regular-season teams for more than a decade but just can’t get over the hump in the playoffs, and in each of the last two years that hump has been the Kings. These were two very good teams that didn’t like each other very much. That was the plan. The first part of that plan hasn’t really worked out. Both teams have struggled, and instead of Saturday’s game being a showdown for top spot in the Pacific, it was a battle for the conference’s final wild-card spot. Despite a six-game winning streak, the Kings went into the weekend having lost more games than they’d won.3 They’ve been chasing a playoff spot for most of the last few months. And yet nobody seems to want to count them out, because they’ve been down this road before in 2012 and 2014, and we know how that turned out. A few Stanley Cup rings will buy you some benefit of the doubt. The Sharks do not get the benefit of the doubt, because they’re the Sharks, and we’ll get to that in a second. They went into the game holding down that final playoff spot, two points up on Los Angeles. But the Sharks were stumbling, having won just three of 10 games in February. There’s a good chance there won’t be room for both teams in the playoffs. Of course, that just made the stakes feel higher, and on Friday, players on both teams kept coming back to the importance of blocking out all the hype and just getting those two precious points. That’s standard talk for these outdoor games, but these guys sounded like they meant it. After all, the part about not liking each other still stands. In the last five seasons, no two teams have faced each other as often as the Kings and Sharks, and they rarely come out of those contests in good spirits. That dislike didn’t show itself much in the early stages on Saturday — for some reason, NHL players always seem to be on their best behavior in these showcase games — but as the game wore on, the intensity picked up. Post-whistle scrums became common, several involving John Scott looking like he wanted to punch anyone within arm’s reach, which is to say everyone. If you wanted to win a game in this football stadium, you were going to have to fight for every yard. The Kings came out strong and controlled much of the first period, perhaps enjoying some advantage from having played outdoors once before. They jumped out to the lead when Kyle Clifford tipped in Jake Muzzin’s shot less than three minutes in. But as the period wore on, the Sharks seemed to find their legs, and they were rewarded with a minute left when Brent Burns seemed to surprise Jonathan Quick with a shot right off a faceoff. Tied 1-1 after one period, the Sharks hadn’t played well. But they survived. Not to put too fine a point on it, but there’s reason to think the San Jose Sharks may be broken, and that we can blame the Kings for breaking them. Some of those decisions look questionable now. The team appeared to blame Joe Thornton, letting their longtime captain and franchise player twist in the wind of trade rumors and then stripping him of his C. They swore they’d rebuild, then barely did anything. They made us wait for the naming of a new captain, then didn’t bother. On the eve of the season, they talked about emerging from that devastating playoff loss a tougher, better team. So far, they’ve been anything but. In a twisted way, this could all work out for the Sharks. They’ve spent most of the past two decades playing the role of the favorites that can’t quite get it done. Maybe this is the year they sneak into the playoffs as underdogs, are all but written off, and then find the kind of hot streak that some team always finds, usually against San Jose. It could happen. But it looks like they’ll have to go through the Kings to get there yet again, this time in the regular season. All of which made it somehow fitting that Saturday’s game started to increasingly feel like a playoff game, in style if not quite in atmosphere. The score stayed tied at 1-1 through a hard-fought second period, with space tight and scoring chances rare. And after a strong Kings start, it was the Sharks’ turn to control the play. After the game, McLellan said they made an intermission adjustment to focus on playing a north-south game through the neutral zone after realizing that the outdoor ice didn’t allow for intricate passing. It worked, and the Sharks dominated long stretches. But it didn’t translate into a goal. For the first 19 minutes of the second period, Quick turned San Jose’s shooters away; in the final minute, his goalpost did the job against Logan Couture. After two periods it was still tied 1-1, and you had your pick of narratives heading into the third. The Sharks had the chance to finally beat these Kings when it mattered. The Kings had a chance to twist the knife even further. There’s a third California team, of course: the Anaheim Ducks. The Ducks have their own checkered history, one that starts off with a professional sports franchise being named after a children’s movie and includes a fever-dream opening night ceremony featuring dancing mushroom men and a mascot named Iceman who was fired after one game. California hockey, man. It’s always something. The Ducks weren’t involved in the weekend’s festivities, but they loomed over it. The Ducks have spent most of the season pushing for the top spot in the league and have all but locked up first place in the Pacific. With the Sharks and Kings fighting for a possible wild-card spot, there’s a good chance that one of these teams will face the Ducks in the first round. That’s some prize: Claw and scratch your way through the next 20 games or so, and you might get to face one of the best teams in the league in the first round. But hey, it’s still the playoffs. What’s the worst that could happen? Oh, right. Sorry, Sharks fans. The Ducks would have felt right at home as Saturday’s tight game wore on, given their magical powers when it comes to one-goal games.4 As most hockey games tend to do, this one started to give off an unmistakable “next goal wins” feel. Dwight King had the first chance to score that goal early, sent in alone on a short breakaway off a blown Sharks line change less than a minute in. But he slid it just wide, with Antti Niemi maybe getting just enough of a pad on it. That seemed to inspire the Sharks, who applied strong pressure over the next few minutes. And then, disaster. All-Star defenseman Brent Burns coughed up the puck to Marian Gaborik in the neutral zone, sending him in on a partial break. With three Sharks closing in on him, Gaborik teed up a slap shot from the top of the circle and beat Niemi to give L.A. the lead. The teams traded chances the rest of the way, with the Kings missing a few opportunities to expand the lead early and the Sharks coming on strong late. Couture just missed on a backhand chance in close, and Wingels nearly chipped in a rebound. The Sharks got Niemi out for an extra attacker for much of the final two minutes, but the Kings calmly held their ground, looking every bit like a team that’s done this before. There’s actually one more Californian NHL team, or at least there was. 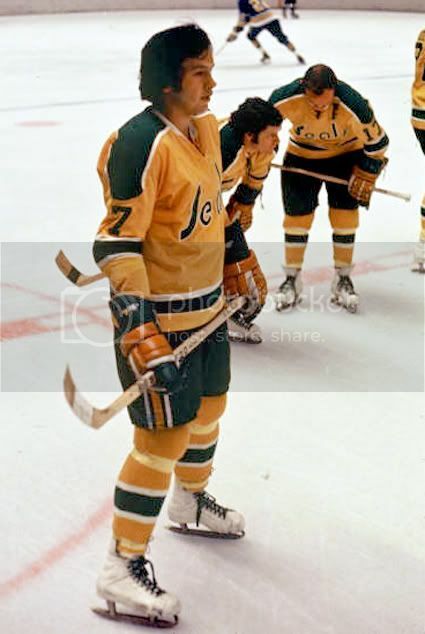 They were based out of Oakland, they were called the Golden Seals, and they survived less than a decade before moving to Cleveland and then folding. The only thing most fans remember about them is that they sometimes wore white skates. Look, I told you the NHL’s history in California was weird. Let’s never speak of the Golden Seals again. After the game, a stream of disappointed players in the Sharks locker room5 tried to explain what it meant to lose to the Kings on a big stage, yet again. The win pushed the Kings past not just San Jose but Calgary, too, all the way up into third place in the Pacific, while the Sharks dropped to 10th in the conference. And now we’re waiting to see if Los Angeles can roll all the way to a repeat. And we’re left wondering if these are still the same old Sharks. In a state full of strange hockey history, we seem to have reached the default state between these two teams. Then again, Saturday’s silly diapers-and-shawls look probably had Kings fans begging for the old uniforms. They brought it with them as part of Saturday’s pregame festivities at Spectator Plaza, which was absolutely packed. Although they’re still well over .500, because the NHL standings are stupid. Well, they would have felt at home right until the scoreboard found a guy in a Ducks jersey and the whole stadium united to boo him. Well, the 49ers locker room, but we could pretend for a day. After Friday’s practices, the league allowed players to bring friends and family onto the ice, and most of the Sharks took the opportunity to skate with their kids and significant others. Barely any Kings bothered.